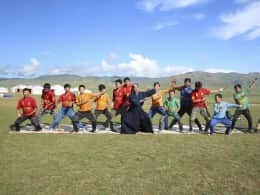 Answers to some of the most common questions about The Pavilions Mongolia Summer Adventure Camp for 2019. 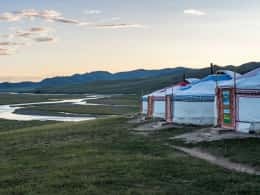 Nestled in the spectacular Orkhon Valley National Park, The Pavilions Mongolia offers a unique wilderness experience in partnership with The Genghis Khan Retreats. The camp is a one of a kind pop-up summer oasis for those seeking serenity, adventure and a renewed connection to life and nature. With a range of activities including horseback riding, kayaking, rock climbing to name a few, and immersive experiences into Mongolian life, it’s sure to be one of the most memorable trips of a lifetime. Join us at The Pavilions Mongolia, where travel meets adventure. Where is The Pavilions Mongolia located and how do I get there? Perched atop Mongke Tengri Hill, Orkhon Valley National Park, the camp is located 360km west of Ulaanbaatar/25km west of Karakoram, accessible by private car from Mongolia’s capital. What is the airport code and ground transfers available? Fly to Chinggis Khaan International Airport Ulaanbaatar, Airport Code ULN. Your stay begins with your transfer to The Pavilions Mongolia. We will pick you up from the Airport Ulaanbaatar Airport (ULN) or from your hotel, depending on your flight arrival time. Our services do not include flights. Airlines servicing ULN include MIAT, Mongolian Airlines, Air China, Turkish Airlines and Cathay Pacific. How long is the drive to The Pavilions Mongolia? The drive to our camp in Mongke Tengri from Ulaanbaatar typically takes five hours though this may vary. We take a break for lunch about three hours outside of Ulaanbaatar and the final half hour of the journey is off-road, along ridges and valleys. Necessary for off road driving and extremely comfortable, we use 4x4 Toyota Land Cruisers or Similar, for our transfers. Each vehicle carries a maximum of four passengers with luggage and is equipped with air conditioning. Large groups will be split between two, or more, vehicles and child seats can be provided upon request - but please do tell us in advance if these are required. Transfer charge: USD$350 each way per vehicle, maximum four people per vehicle. Visa requirements for Mongolia differ depending on the length of your stay and country of origin. US Nationals can travel in Mongolia for up to 90 days, visa free. Unless listed as a visa-free country on the Mongolian immigration website, you are required to apply for a visa in advance of travel please allow plenty of time to obtain travel visas. A minimum stay of 5 nights is required for individual clients or small groups and 7 nights for take overs, this is to ensure that you fully appreciate your stay with us and to allow you sufficient time to experience all of our all-inclusive activities and beauty of Mongolia’s Orkhon Valley National Park. 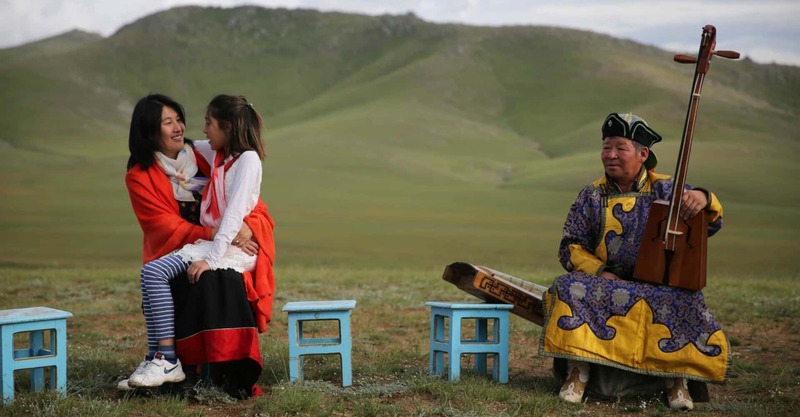 The Pavilions Mongolia is open from 15 June – 19 September 2019. This is a seasonal camp set in the UNESCO Okhron Valley. Once the season ends, we pack up, leaving no carbon footprint. Daily all-inclusive rates start from USD$600 per adult, under 18 years old USD$350, Under 7 years old USD$150 per night. There is no charge for children under the age of three. Your stay includes all meals, daily activities including horseback riding, kayaking, hiking, area guided tours, yoga classes and massage treatments. For details, please see our list of experiences. What does the daily all-inclusive rate include? 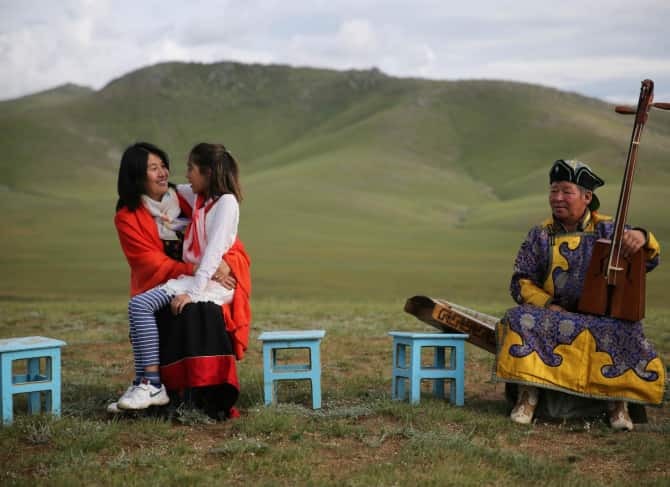 All revenue goes directly to the staff, the local nomadic families that work with us, and to Genghis Khan Retreats, our operating partner and Mongolia expert. Genghis Kahn Retreats was originally established in 1996 to revive polo in Mongolia and to provide training and support for a young generation of Mongol riders with extraordinary equestrian skills. All meals are served family style in the Dining Ger, including breakfast, lunch and dinner and beverages such as soft drinks, tea/coffee, and house wines and beers during evening meals. Your all-inclusive stay features an array of cuisines, using the locally sourced organic, seasonal ingredients for breakfast, lunch and dinner. Daily meals are served family style in the dining ger, featuring delectable traditional Mongolian dishes as well as an array of international favourites. It’s not just all meat in Mongolia, and our culinary team prepares the best of the season, whether its freshly caught local fish, handmade traditional breads and noodle dishes, salads and more. Guests enjoy evening meals alongside a nightly selection of wines and spirits, including Mongolian vodka. Our chef is happy to accommodate special dining requirements for our vegetarians, vegans and pescatarians guests with advance notice of your stay. There is no age limit for children to come to camp, but participation in activities is at the discretion of parents and the management of the camp. How many guests can the camp accommodate? The camp is comprised of 20 Gers, each one accommodating two adult guests comfortably. Our maximum number of guests at one time is 25 adults and children, so we may best serve our guests. What is a Ger and what should I expect from the stay? 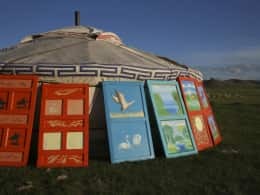 A Ger is a luxury traditional Mongolian tent. Our Gers are lit by candlelight and each comes with its own wood-burning stove and in-ger French press coffee makers. Relax and sleep in the peacefulness in the heart of Mongolia under luxurious duvets, pillows and cotton sheets topped with cashmere blankets. What about the bathroom facilities? In addition to the camping toilets inside the Gers, the camp also includes a number of external toilet facilities. These are essentially ‘long drops’, covered with a toilet seat, enclosed by three walls and boasting lovely views of the valley and river below. Three of our Gers come with wooden Japanese-style bathtubs. There are also stand-alone, wood enclosed, gravity showers overlooking the Orkhon River. All water is pumped from a well and heated by a wood fire. Loose, light, summer clothing is normally appropriate during the day time and a jumper or fleece is a good idea for cooler evenings in July and early August. Be prepared for many types of weather during your stay, by packing layers including a windproof/waterproof layer. Bring sturdy shoes for hiking and biking, and a swimsuit. Smart casual clothing is suggested for evening meals. We ask that guests bring their own riding boots (with a ½ - 1inch heel) and when possible, your own riding hats, though we have a selection of helmets and chaps at the camp. What is the WiFi and connectivity like? The camp includes a tech ger where we have solar-batteries to charge phones/laptops/cameras. We are in a national park therefore there is no electricity line! We hope you can completely unplug, however, Wi-Fi is a few minutes’ drive away for connectivity, by bike (15 minutes), or walk (25 minutes) to a hilltop for a signal. There are camp cars available to take guests up to the hill upon request. Or if you prefer, guests may prepare emails and pass their device to a team member will hand carry your iPad to the next top of the hill to reach a connection spot! We have a landline phone in the camp for emergencies. All water is drawn directly from our well which is fed by a mineral spring; it is potable and safe for use. Yes, travel insurance is a must – please check that the policy covers the activities that our camp offers and ‘Force Majeure’ events, before you purchase it. Are there doctors on site? The camp employs a camp doctor during the season and there are hospitals 25km away, in Hujirt and Karakoram. Emergency helicopter rescue service can be activated dependent on the client’s prior arrangement with their insurance company. Contact SOS Medica Mongolia for more details www.sosmedica.mn. SOS Medica Mongolia can also send out a doctor and an ambulance by road from Ulaanbaatar. Who do I contact to make a booking? Contact us by email: [email protected] or by completing the online inquiry form. Once your dates are confirmed for your request, 50% of the payment will be due at time of booking. The remaining 50% payment is due 30 days prior to the start of the trip. If booking a trip that commences in less than 30 days, the full price must be paid in full at time of booking. We reserve the right to make changes to guests’ trips to take in account any changes in weather or other factors that may affect your safety. Guests are expected to have comprehensive travel and medical insurance including cover for events falling under ‘Force Majeure’ which means any event or circumstance or condition which is either unforeseeable or beyond our reasonable control. Cancellations made up to 30 days before the start of the trip will be refunded in full, less the money transfer charges. Cancellations made less than 30 days before the start of the trip, and ‘no-shows’, will be charged at full cost.